However most railway historians[who?] now regard it as a costly failure and a missed opportunity; an attempt was made to simply update the railways as they already stood rather than reacting to changes in the way goods and people were travelling in the post-war years. Massive investments were made in marshalling yards at a time when the small wagonload traffic which they dealt with was in steep decline and being lost rapidly to the roads. The Modernisation Plan called for the rapid and large-scale introduction of diesel locomotives: a total of 2500 locomotives to be procured in 10 years at a cost of £345 million. With political considerations all-but requiring that all these locomotives be built by British firms, the scope of this project was beyond the existing capacity of the British locomotive industry. This led to many designs being submitted, and accepted, from manufacturers with little or no direct experience in main-line locomotive construction. The short timescale of the Plan also meant that there was little time for prototype locomotives to be properly evaluated, trialled and, if needed, modified or improved. Several large orders for hundreds of locomotives were placed while the prototype was still undergoing testing or even, in some cases, before the prototype had even been built. Accepting orders from a myriad of manufacturers also led to BR acquiring an unnecessarily diverse locomotive fleet, with large numbers of different but similar classes. This increased the cost and complexity of maintenance and led to operational difficulties (for instance there was no universal system for multiple working). The poor reliability of many of the locomotive designs procured under the Modernisation Plan led to much lower availability ratings than predicted and the large-scale withdrawal of several classes or the curtailing of planned orders, leaving BR short of suitable motive power in some areas. Some of the diesel classes ordered in 1955 were withdrawn before the steam locomotives they were intended to replace. The InterCity 125 was planned as a stop gap measure, meant to fill until electrification was spread across all main lines and the Advanced Passenger Train (APT) was in service. Research had begun for the tilting train but it was not possible to predict when the APT would enter service. The HST applied what had been learned so far to traditional technology – a parallel project to the APT development, based on conventional principles but incorporating the newly discovered knowledge of wheel/rail interaction and suspension design. The class holds the world record for diesel traction, achieving 148.4 mph (238 km/h) with a shortened set running speed trials between Darlington and York. Unlike the APT, the InterCity 125 was an outstanding success and is still in widespread use in as of 2017[update]. The Hidden report also reacted to criticism[by whom?] of the 1950s-designed Mk 1 coaching stock involved in the accident. The report accepted that withdrawal of the Mark 1 units was not practical and the design was safe: "The inventory of Mark I coaching stock is large, and much of it has not reached an end of economic life, nor will do so for another decade or more. Mark I vehicles have good riding qualities, and are not intrinsically lacking in collision resistance." 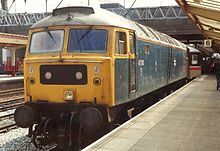 British Rail was still using multiple units with underframes that had been constructed before World War II and these had priority for replacement.